Our team has over 10 years of experience providing online marketing and web design solutions to doctors. of ad impressions and thousands of patients to our clients’ practices. Get new patients with a stunning new website designed from scratch. We do not use templates. Our websites boasts features such as superior design, latest web technology with a great user interface, making updating your website easier than ever! Go to the top of the search results in just 3 days! 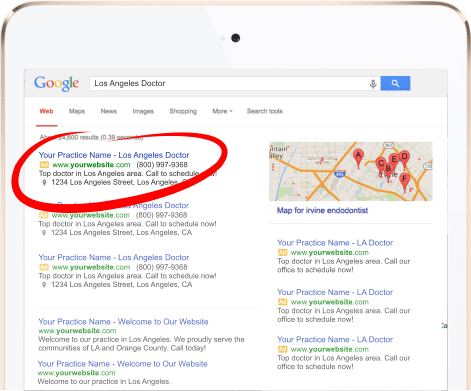 We are the highest ranked dental and medical marketing company by Google users. Get your fair share of online patients. We do not charge a setup fee and do not require a contract. Sometimes written content is not enough to keep people’s interest. Videos are great visual simulators for patients who are looking for more information on specific procedures. We offer educational pages with integrated videos for hundreds of procedure. Social media is a great way of engaging in direct communication with your patients and prospective patients. Social marketing is ideal for offices that want to maximize their online exposure. This includes custom Facebook, Google Plus, Twitter profiles and custom blog. SEO is critical to any marketing campaign worth a fighting chance. We use the latest technology in SEO to enhance your online presence. By establishing external networks of links, advanced on-site optimization and hundreds of other methods, we get you results. Online reviews have become an integral part of decision-making for patients across the internet. Managing your image online is now more important than ever. Our review creation modules help you to just do that. Contact us for more information. For both new and existing practices it is important to develop a recognizable identity. Our branding package including brochures, business cards, letterheads, logos and much more. You’ll work with a skilled designer to bring your vision to life. Go to the top of the search results in just 3 days! We are the highest ranked dental and medical marketing company in the world. Get your fair share of online patients. We show you proof before we start. Over 300 Top 3 Dental & Medical Keywords! Dr. David They have done a phenomenal job, my patients love the websites (as do I)… I appreciate all their work especially because I’m pretty specific and demanding with what I want, and Optimized 360 has delivered pretty much everything I could ask for. Highly recommended!!! …extremely responsive, creative, and gave our website a very professional look. Overall, I have to say that our site was a huge production…We’ve received many compliments. We know what it takes to stand out, that’s why we don’t use templates and our websites are created from scratch. Higher quality, faster websites with higher conversion are just a few example of what sets us apart.